Our lives are full of events. Many of them are wonderful, others are terrible. The only thing we can do is choose how we respond to them. A friend once told me every event in life can either make you bitter or better. I have taken this phrase to heart. I have chosen to become a victor no matter what curves life throws at me. This blog will chronicle my walk to victory. I am a large fellow. Six months ago I weighed myself in terms of “error”. For the past decade every time I stood on a digital scale it just gave me “error”. From visiting doctors I knew my weight continually varied between 375 and 390. Back in October my wife left me. This proved to be one of the hardest curve balls that life has ever thrown me. I didn’t know how to handle the situation. The only thing I did know was that I had the power to choose how this event would affect me. As a result of the grief I was experiencing I stopped eating and began a to lose weight rapidly through the months of November and December. I don’t know exactly how much I lost in that first month or two but it was a lot. 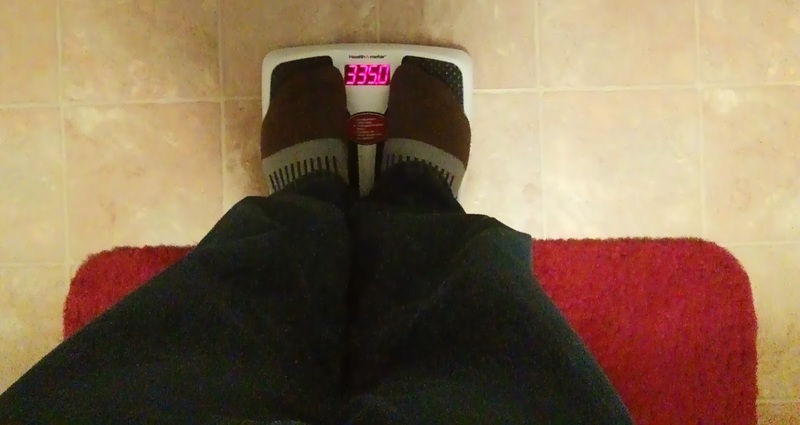 As of this week though I hit a milestone, I stood on a digital scale and it gave me a weight. Now I know that 335 lbs may still seem like a lot to some people, but I haven’t been this weight in over a decade. I feel better since losing weight, not just physically but emotionally too. Over the past months I changed my eating, exercising, and other habits for the better. I have set myself a goal of getting down to 250 lbs and I intend to achieve it. Now even though I am a big guy. I have always been rather active. I always loved fishing and hiking. This is where I tend to spend my free time. Lots of people like going to the gym or other methods of exercise to help them stay fit. I think those methods are great, they just aren’t for me. Starting in May 4, 2015. My sister and I will be heading to hike the Appalachian trail (AT). Together we decided to start by walking a 400 mile section of the AT. This will be a huge accomplishment for me. So excited to follow your journey! You are awesome! We love ya, especially Carter! I love this! I love your attitude and that you have chosen to get through your hard times. Blessings will come for you. Can’t wait to see what they are! So excited to see how this trip the AT goes! Love to you. 🙂 You Go Messil. I wish I had the guts to have done something like this. I will live it through the two of you! Can’t wait to read all about the adventure!. Love you! I just stumbled onto your blog. I’m glad I did. Like you, my wife left me. Unlike you, I wallowed for a year in self pity and despair and depression. But, thankfully, I’ve come around and decided to get one with life and lose weight and get fit. Wish the absolute best to you.